“Democracy… does not come from the government, from on high, it comes from people getting together and struggling for justice.” – Howard Zinn, Spelman College commencement address, Atlanta, 2005. Politicians are elected and selected, but mass movements transform societies. Judges uphold, strike down, or invent brand new law, but mass movements drag the courts, laws and officeholders all in their wake. Progressive and even partially successful mass movements can alter the political calculus for decades to come, thus improving the lives of millions. Social Security, the New Deal, and employer-provided medical care didn’t come from the pen of FDR. The end of “separate but equal” didn’t come from the lips of any judge, and voting rights were not simply granted by the Voting Rights Act of 1965. All these were hard-won outcomes of protracted struggle by progressive mass movements, every one of which operated outside the law and none of which looked to elected officials or the corporate media of those days for blessings or legitimacy. It’s time to re-learn those lessons and build a new progressive mass movement in the United States. Mass movements exist outside electoral politics, and outside the law, or they don’t exist at all. Mass movements are never respecters of law and order. How can they be? A mass movement is an assertion of popular leadership by the people themselves. A mass movement aims to persuade courts, politicians and other actors to tail behind it, not the other way around. Mass movements accomplish this through appeals to shared sets of deep and widely held convictions among the people they aim to mobilize, along with acts or credible threats of sustained and popular civil disobedience. Not all mass movements are progressive. The legal strategy of “massive resistance” to desegregation on the part of southern whites, in which local governments across the south threw up thickets of lawsuits, evasions and new statutes, closing whole school systems in some areas rather than integrate, was implemented in response to and backed up by the historically credible and ever-present threat of armed, lawless white mobs long accustomed to dishing out violence to their black neighbors and any white allies with impunity. They operated in a context of popular belief in white superiority and black inferiority that was widespread among whites of that region and time. Undeniable proof of the existence of a violent, white supremacist mass movement was broadcast around the world when thousands of local white citizens showed up to trade blows, insults, and gunfire with federal marshals in places like Little Rock, Arkansas in ‘57 and Oxford, Mississippi in ’62. Likewise, courts and public officials who enforced desegregation orders were under relentless pressure from a civilly disobedient mass movement for equality and justice. 89 leaders of the 1956 Montgomery Bus Boycott could not have been surprised when they earned conspiracy indictments for their trouble. Tens of thousands of mostly southern, mostly black citizens defied unjust laws and were jailed in the waves of mostly illegal sit-ins, marches, freedom rides and other mostly illegal actions that swept the South for more than a decade. This movement in turn relied on the deep convictions of all African Americans and growing numbers of whites that segregation and white supremacy were evils that had to be fought, regardless of personal costs. For many, those costs were very high. Some are still paying. Democratic party leaders instructed Jesse and the crew to go home and await the results of court decisions. The black leadership acquiesced, and a chance to galvanize a civilly disobedient mass movement around issues of voting rights was missed. Mass movements are based on widely held beliefs, reinforced by dense communications networks. Mass movements are nurtured and sustained not just by vertical communication, between leaders and constituents, but by lots of horizontal communication among the movement’s constituency. This horizontal communication serves to reinforce the constituency’s and the movement’s core values. It emboldens ordinarily non-political people to engage in personally risky behavior in support of the movement’s core demands, and builds support for this kind of risk-taking on the part of those who may not be ready to do it themselves. If a progressive mass movement is to be built in this era of sprawl and locked down media monopolies, organizers must develop and deploy alternative communications strategies to get and keep the movement’s message into a sufficient number of ears to sustain its influence and momentum. Mass movements don’t happen without masses. A mass movement whose organizers cannot fill rooms and streets, and sometimes jails on short notice with ordinarily non-political people in support of political demands is no mass movement at all. Organizers and those who judge the work of organizers must learn to count. A progressive mass movement is inconceivable without a prominent place for the energy and creativity of youth. The finest young people of every generation have the least patience with injustice. SNCC was the Student Nonviolent Coordinating Committee, after all, and included high school and college students across the South. The average age of rank and file members of the Black Panther Party was 17 to 19. SCLC’s leading ministers in the early 60s were mostly under 30. The 1960s movement for civil and human rights was spearheaded, and often led by young people. Neither Martin Luther King nor Malcolm X lived to be forty. Fred Hampton was only 21. Any mass movement aiming at social transformation must capture the enthusiasm and energy of youth, including the willingness of young people to engage in personally risky behavior. Mass movements are creations of the political moment, rooted in the shared values of their core constituencies, nurtured by dense communications networks among a supportive population. They are sustained by aggressive leadership, and youthful enthusiasm. Mass movements inevitably employ civil disobedience, and the civilly disobedient components of mass movements must be carefully calculated in such a way as to maintain support from broad sectors of the population it aims to mobilize, and to increase support if they are violently repressed. Mass movements have political demands anchored in the deeply shared values of their core constituencies. Mass movements look to themselves and their shared values for legitimacy, not to courts, laws or elected officials. A mass movement consciously aims to lead politicians, not to be led by them. Mass movements are civilly disobedient, and continually maintain the credible threat of civil disobedience. Mass movements are supported by lots of vertical and horizontal communication which reinforces the core values of the constituency and emboldens large numbers of ordinarily nonpolitical souls to engage in personally risky behavior in support of the movement's political demands. Mass movements capture the energy, enthusiasm and risk taking spirit of youth. Nobody ever heard of a mass movement of old or even middle aged people. In the absence of any of these characteristics, no mass movement can be said to exist. Reparations? The reparations movement undoubtedly speaks to widespread beliefs among African Americans. But the last big reparations demonstration in Washington, DC might not have drawn ten thousand souls. A mass movement should be able to fill rooms in neighborhoods, not just in whole cities. With no broad masses in motion over reparations, no civil disobedience, and not much traction among black youth, it’s safe to say that there is no mass movement for reparations. The anti-war movement? With the ability to put hundreds of thousands in the streets several times a year in New York City, in DC, and the Bay Area, one to twenty thousands in scores of other US cities and towns, and hundreds more vigils, demos and meetings still happening each week the antiwar movement passes the numbers test. But in contrast to a generation ago, today’s antiwar movement has so little respect for itself and so much reverence for the two-party system that it practically shut down months before the presidential election to allow most of its leading lights to actively campaign for a pro-war candidate. There is not much evidence of broadly popular antiwar civil disobedience yet, either. When the antiwar movement loses its reverence for judges and elected officials, and discovers some creative and popular ways to break the law, it will be a mass movement. The Million Man March and the Millions More Movement? While certainly big enough, the 1995 MMM was only a single day’s event. Although the still-existing policy of selective mass incarceration of black men was in full swing, the MMM made absolutely no demands for the transformation of society. It was, its leader said, all about “atonement.” There was no civil disobedience, and no intent to sustain any militant action. Organizers of the MMM remembered to collect money, but somehow neglected to pass around a signup sheet, something even the most amateurish organizer knows must be done. What an organizing tool a million man mailing list might have been! The organizers of the 1995 affair who are driving the bus again this year, haven’t criticized themselves for not taking attendance, or for coming to Washington to ignore political issues like health care, voting rights and mass incarceration, or for excluding gays and women. What kind of mass movement excludes women? Neither version of the MMM looks like a mass movement. Labor? Union rights, pensions, Social Security and health benefits were won by a struggle with all the hallmarks of a mass movement. But that was two or three generations ago. Today’s labor movement isn’t capturing youth, doesn’t do civil disobedience, is unsure of what its core values are, and collects dues to give to the “least worst” politician instead of trying to make politicians follow its lead. Whatever else it is, labor is not a mass movement any more. Both in 1970 and a hundred years ago, this had all the characteristics of a mass movement. Political demands, big numbers, leaders not afraid to call politicians to account, and a fair amount of public, popular civil disobedience. They eventually forced courts and politicians to follow them rather than the other way around, and with some of their key demands met, creative civil disobedience ceased, replaced by reliance on courts, elected officials and corporate sponsorship. Right now, there is no mass movement for the full equality of women. A new Supreme Court, if it overthrows Roe v. Wade will make the re-emergence of such a movement much more likely. The religious right possesses a mass base, along with ambitious and profoundly scary leaders. With corporate support it has been successful in building its own communications networks and influencing or seizing outright control over many civilian and military institutions. The religious right does not follow politicians. Politicians pander to it. Whenever the religious right starts being civilly disobedient, we will see a mass movement with the potential to take us far down the road toward fascism. There is only one place America’s next progressive mass movement can come from. There is only one identifiable constituency with a bedrock majority of its citizens in long term historical opposition to our nation’s imperial adventures overseas. This is America’s black one-eighth. While majorities of all Americans do believe in universal health care, the right to organize unions, high quality public education, a living wage, and that retirement security available to everyone ought to be government policy, and many even believe America is locking up too many people for too long, support for these propositions is virtually unanimous among African Americans. “African Americans remain in remarkable, consistent agreement on political issues, a shared commonality of views that holds strongly across lines of income, gender and age. The Black Commentator's analysis of biannual data from the Joint Center for Political and Economic Studies confirms the vitality of a broad Black Consensus. Most importantly, the data show that Black political behavior has not deviated from recent historical patterns, nor is any significant Black demographic group likely to diverge from these patterns in the immediate future. The original article, from which the above paragraph is lifted, is well worth reviewing in its entirety. It is the statistical persistence of the Black Consensus over decades of polling data and across classes, generations and regions which marks out America’s black one-eighth as the likely origin, and the first indispensable core constituency of any progressive mass movement to transform American society. 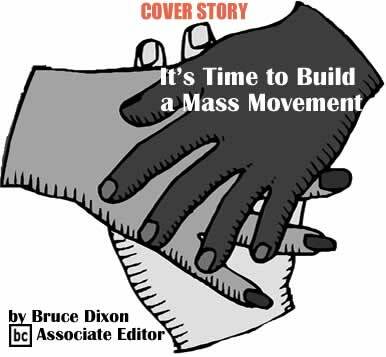 If such a mass movement is to succeed, it must not allow itself to be contained within the black community. But that’s where it has to begin, around the core political demands of the Black Consensus. Hence African American elected officials and candidates for office on every level, from the Congressional Black Caucus to local sheriffs and prosecutors must be forced to address themselves to the Black Consensus. They must be summarily judged for their positions on such issues as racially selective mass incarceration, the unjust war in Iraq, American complicity in the apartheid-like policies of Israel, universal health care, equality of educational opportunity, and voting rights, and these judgments made to stick. Mass movements do not and cannot follow political office holders. A mass movement is an assertion of popular leadership by the people themselves. It makes politicians into followers.